Blood vessels are the part of circulatory system which functions to transfer blood all through the body. Blood vessels can be classified as arteries, capillaries and veins. Capillaries is 60,000 miles long. That is long enough to go around the world more than twice. All the blood vessels have same basic structure, they are designed so to supply the oxygen and nutrients to tissues of the body. The structure of a blood vessel contributes to its functional characteristics. The anatomic identification of blood vessels is based on the presence of up to three histologic layers: tunica intima, tunica media, and tunica adventitia. 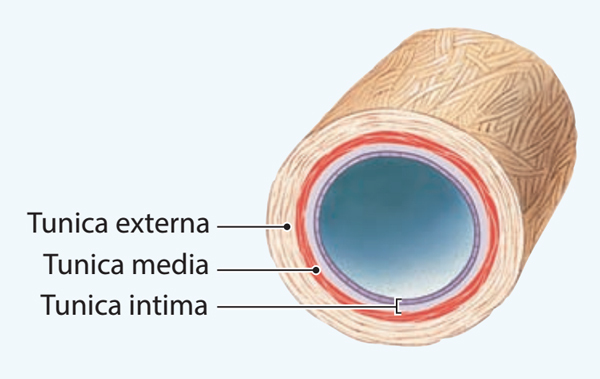 The tunica intima is the innermost layer of the blood vessels. It is a layer of endothelial cells that is in contact with the blood. Permeability of this endothelial layer is determined by the endothelial cells, the tight junctions connecting the endothelial cells together, and the presence of pores that extend through the endothelial cell. The tightness of the junctions between endothelial cells varies among tissues. For example, the very tight junctions of cerebral capillaries restrict movement of some drugs to brain cells (the blood-brain barrier). In contrast, the endothelial cell pores and relatively loose junctions in the liver and spleen allow easy transit between the blood and tissue spaces in those organs. The endothelium has surface proteins, or adhesion molecules, that allow white blood cells to attach and cross from the circulation into the tissues. The endothelium generates substances such as nitric oxide (endothelial-derived relaxing factor, EDRF), allowing ingested nitro-glycerine, friction, and stress to cause vasodilation. Damage to the endothelium may allow blood to enter the middle layer of a blood vessel, creating an aneurysm. The tunica media is the middle layer which consists of elastic connective tissue and smooth muscle cells. In the aorta and large arteries, the elastic tissue contributes to the shape of the arterial pressure pulse. Smooth muscle contraction controls the diameter of the vessel and causes a change in blood flow and blood pressure. Smooth muscle is normally partially contracted because of sympathetic nerve activity. Smooth muscle contraction also can be regulated by circulating hormones and in the smaller vessels by tissue metabolic factors. The tunica adventitia is the outermost layer which consists of a relatively thin layer of connective tissue that provides shape for the blood vessels. This layer also houses the vasa vasorum, the small arteries, and veins that provide nutrients to the cells of the blood vessel.